A Tibetan exile carries her child as she walks toward the Tsuglagkhang temple in Dharamsala, India, March 19, 2016. Event organizer Lobsang Wangyal has to travel overseas often, but as a Tibetan refugee born in India, he did not have a passport and sometimes had to wait days to get the mandatory permits every time he went abroad. So Wangyal, whose parents fled Tibet as teenagers, went to court to demand his right to an Indian passport. In response to his petition, the Delhi High Court said authorities must abide by an earlier ruling that all Tibetans born in India between January 1950 and July 1987 are Indian citizens by birth, and can be issued passports. The order came into effect in March, and Wangyal got his Indian passport shortly thereafter, using it to go to Thailand. For the first time, he was spared the additional scrutiny that his documents always got from immigration officials. "I feel like a real person now, having obtained a passport," said Wangyal, 47, who was born in a Tibetan settlement in eastern Odisha state and now lives in the hill town Dharamsala. Pema Kyi, a 40-year-old exile Tibetan, sells Tibetan bread by the roadside in Dharmsala, India, June 20, 2017. "Tibetans are seen as refugees and as stateless in India. Being seen that way after having been born and lived our whole lives in India is unfair and impractical," he said. Tibetans have been seeking asylum in India since the Dalai Lama fled Lhasa in 1959 after a failed uprising against Chinese occupation. The Tibetan spiritual leader has since lived mostly in Dharamsala in the northern state of Himachal Pradesh, where his supporters run a small government in exile and advocate for autonomy for Tibet by peaceful means. More than 100,000 Tibetans live in 39 formal settlements and dozens of informal communities across India. They generally arrive via Nepal, after a perilous trek across the Himalayas. The Indian government has funded schools to provide free education for Tibetans, and reserved seats in medical and engineering colleges. Those eligible can get voter identification cards. But Tibetans do not have citizenship rights, which limits their access to government jobs and freedom of movement within and outside India. They cannot own land or property. Passang Topgyal, a 38-year-old exile Tibetan, tests a Tibetan stringed musical instrument called a piwang at his instrument shop in Dharmsala, India, June 20, 2017. In some states, they cannot get driving licenses or bank loans. Those without identity documents are at risk of harassment, arrests and deportation to China. "The status of statelessness is demoralizing and frustrating. There's a lot of emotional turmoil," said Tenzin Tselha, an activist with Students for a Free Tibet, whose father served in the Indian army. "Sometimes I eat rice and daal [lentils] more than thukpa [Tibetan noodle soup], but I never feel Indian; I am Tibetan. It drains my energy, this struggle to always prove who I am and where I am from," she said. Nor does it have a domestic law to protect the more than 200,000 refugees it currently hosts, including Tibetans, Sri Lankans, Afghans, Bangladeshis and Rohingyas from Myanmar. They are all considered foreigners by law. Tibetan refugees get "enough rights and benefits," and not everyone wants citizenship, said Sonam Norbu Dagpo, a spokesman for the Central Tibetan Administration, the government in exile. "Even those Tibetan refugees who qualify for Indian citizenship do not apply for citizenship," he said. 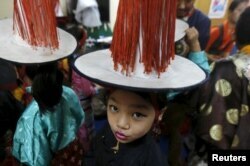 A young Tibetan exile stands backstage as she waits to perform during celebrations marking the 80th birthday of exiled Tibetan spiritual leader Dalai Lama, at Majnu Ka Tila, a Tibetan refugee camp in New Delhi, India, July 6, 2015. While the number of refugees across the world has risen in recent years, the number of Tibetans arriving in India has fallen significantly since 2008, following a crackdown by China, which considers Tibet a renegade province. Only 87 Tibetans registered in Dharamsala in 2015, compared with about 2,500 each year before 2008. "India's policy towards refugees has always been dictated by geopolitical compulsions," said Saurabh Bhattacharjee, a professor at the National University of Juridical Sciences in Kolkata. But beyond ensuring basic protections and civic amenities for all refugees, India must consider the status of Tibetan refugees more carefully, he said. "Will they always remain refugees," he said, "or should they be given some sort of permanent resident status, as they have been here for so long and have little chance of being repatriated?" Recent court orders and the Tibetan Rehabilitation Policy of 2014 promise more rights and benefits. The policy proposes, for the first time, to give refugees welfare benefits on par with Indians, subsidies for some college courses, more job options and greater ease in getting documents. Young Buddhist monks wait to serve cooked rice to the attendees of the Jangchup Lamrim teachings conducted by the exiled Tibetan spiritual leader the Dalai Lama (unseen) at the Gaden Jangtse Thoesam Norling Monastery in Mundgod in the southern Indian state of Karnataka, Dec. 28, 2014. It does not address property ownership, getting government jobs, or traveling freely within and outside India. But the issue of rights and citizenship is also an emotional one that divides the community. "I don't think it's important to have citizenship rights or to have an Indian passport," said Dorjee Tsering, 28, who works in a store in Dharamsala selling Free Tibet T-shirts and sweatshirts. "We may face some problems, but we should sacrifice a little to preserve our heritage and identity." But for Wangyal, who fought for a passport, more rights are necessary. "I would like the right to own property. A little house and a small business would be good to live a decent life," he said. "Tibetans will fight on for Free Tibet, but at the same time we have to live our lives now."